If on a cold dark night, you trip over in the street and end up in the gutter, don’t worry about it, as you won’t be alone. There you’ll find the programming team of RTL 5, thinking up how they can make even more appalling, dumb, crass, moronic reality TV shows to appeal to the lowest common denominator. So as well as the recent Adam Zoekt Eva they have now come up with from Russia with love. The UN should have a serious conversation with the heads of RTL5 as they appeared to have inside information, unknown to the intelligence services of most of the western world. The program is called from Russia with love, and yet, most of it takes place in Ukraine. Did RTL know about Putin’s planned invasion? Why didn’t they warn NATO? The Shallow Man wants to know. So yet again, in spite of the psychological damage inflicted upon me from watching the first episode of this programme, I sat through all 44 minutes of it so I could provide my ever-growing audience with a report. According to late night Dutch TV, there are plenty of geil HOLLANDSE MEIDEN, available at the end of the phone. The Netherlands is full of shall we say not optimally dressed but beautiful single women. Now those of you that have read my book, the Amsterdam Confessions of a Shallow Man will know that I’m partial to Russian ladies but shallow as I undoubtedly am, even I wouldn’t go all the way to Ukraine on the hunt for Russian Antelopes. From Russia with love, does exactly this. It follows the adventures of four Dutch men who travel to Ukraine looking to meet Russian ladies. The fifth protagonist, a 46-year-old, seriously overweight chap called Rene, is in a “relationship” with a 24-year-old, slim and attractive, blond haired blue eyed lady from Belarus. First I’ll start with Jeroen and Gerben, who are 27 and 29. Jeroen, in spite of the fact that he still lives with his mother in a small village of 5000 people, is still single. Shocking! His best buddy Gerben is a well travelled Dutch gentleman who has never been on a plane before, let alone having barely left the village from where he comes. These two eligible bachelors have signed up with a Ukrainian dating come travel agency, where for 1500 euros a head, they will have a trip to Odessa, stay in a “luxury” apartment and get the chance to date with 15 ladies each. The price also includes the airfare. What could possibly go wrong? Jeroen’s mother is concerned that the food in Ukraine will upset his stomach. Also being the caring mother that she is, provides her son with two packets of condoms, which she helpfully goes on to explain that one is for long-lasting sexual pleasure, and the other one is ribbed to enhance performance and stimulation. Jeroen shows his mother some of the profiles of the ladies that he can choose for dates. One of whom has a degree. His mother warns him not to waste his time with her as she’s too intelligent and probably won’t look after him. There’s only one other challenge that I see for Jeroen and Gerben, they both speak terrible English, in fact, the ladies shown, speak better English than they do. These two fine Dutch Lions are a little older and wealthier. Niels is 53 and Christian 38. They are both looking for serious relationships. Niels lives in the tinder capital of the world, Amsterdam, so why he feels the need to go to Ukraine is beyond me. They both have their own businesses and don’t just take any old package. They sign up for the “romance tour” a 3000 dollars a head package deal arranged by an American company that promises that each man will meet a minimum of eight girls per person per day for the duration of the tour. I’m sorry to report to all you lovely Dutch ladies that Niels thinks that eastern European women are far more feminine than the Dutch variety. Being the sommelier of fine women, he even adds that eastern Europeans have smaller heads and flat bellies, which as everyone knows are the essential characteristics one needs when looking for a serious relationship. Rene, Rene, Rene. I shake my head as I write this, why Rene? He seems like a genuinely nice guy, he’s 46 and while on holiday in Belarus met the 24-year-old Olya. She is now visiting him in the Netherlands for the first time. Rene seems like a lovely guy, he’s romantic, in a cheesy kind of way. For example, he buys rose petals (rather than stealing them from his neighbours gardens) and scatters them from the front door, all the way up the stairs to the bedroom. How lief van hem. Rene, nice guy but so naive!!! He’s looking for love, and I’m sure she’s seriously in love as well… with the idea of a Dutch passport, and an overweight husband who will die before his time leaving her sitting pretty. I actually watched a bit of the following episode, where Rene, dumber than Lady Gaga, Rihanna and Justin Bieber together, has actually proposed to Olya. I was shouting at the TV, “don’t do it, Rene, she’ll bleed you dry.” Zielig! Going back to Niels and Christian, on the first leg of their “Romance tour” they attended a party with perhaps eight guys and over fifty ladies who were all on display like the slightly out of date fruit that one sees on stalls at the Albert Cuyp Market. Actually, a better analogy would be that the ladies were circling like sharks around a raft in the middle of the ocean, on which were sat eight men with more money than sense. 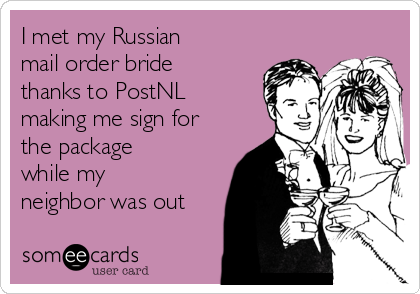 No naive Dutchmen were hurt during the writing of the post, but in time, they will be. For more of from Russia with love, click here.